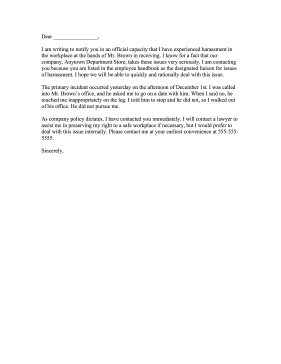 Employees can use this workplace complaint letter to report harassment to HR. I am writing to notify you in an official capacity that I have experienced harassment in the workplace at the hands of Mr. Brown in receiving. I know for a fact that our company, Anytown Department Store, takes these issues very seriously. I am contacting you because you are listed in the employee handbook as the designated liaison for issues of harassment. I hope we will be able to quickly and rationally deal with this issue. The primary incident occurred yesterday on the afternoon of December 1st. I was called into Mr. Brown's office, and he asked me to go on a date with him. When I said no, he touched me inappropriately on the leg. I told him to stop and he did not, so I walked out of his office. He did not pursue me. As company policy dictates, I have contacted you immediately. I will contact a lawyer to assist me in preserving my right to a safe workplace if necessary, but I would prefer to deal with this issue internally. Please contact me at your earliest convenience at 555-555-5555.